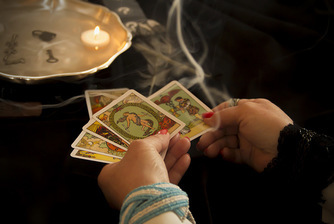 Tarot cards are great carriers of profound messages and they never fail to provide a wide range of responses that work both individually and collectively. A few days ago the young Pakistani girl who was shot in the head by the Taliban for speaking up against their ban on girls attending school, was awarded the Nobel Peace Prize. Her story is more than amazing but it is also a great example of what the Strength card in Tarot represents. Malala Yousafzai spoke against a regime of terror and fought the limitations imposed by a group of fundamentalist bullies who kept her village under surveillance and were happy to terrorize and brutalize anyone who opposed them. However, the most interesting part of the story is that Malala never fought violence with violence or tried to form another army to fight the impositions of this group. Instead, she continued protesting and demanding her right to be educated. Her fight was not about religion and did not oppose anyone's principles beyond questioning why if education is a human right, she was not allowed to access it. The card of the Strength shows a woman holding the mouth of a lion. The woman does not show any fear but she is not imposing brute force on the lion. Rather, she seems to be gently controlling an impulsive creature that possess magnificent power yet she is not afraid neither has any weapon or tool to fight the beast. Strength may be precisely what we are needing at the moment. We cannot fight against ebola, cancer, terrorism, fundamentalism, chaos, invasion, obesity, poverty or anything else for that matter. But we have all the strength we need to use our resources in a way that allow us to achieve better results. What if instead of fighting for the sake of opposition, we use the creative power represented by the lion to find alternative solutions to the problems we face?